ugghh..... once i stayed in a village in northeastern India and i went into the bathroom to take a bath... and there were two HUGE spiders near the shower faucet. I was too afraid to turn on the water so I didn't bath that day. Ah come on, look at how big and clumsy it looks... It's kind of cute. It's the golden retriever of spiders! If my poor husband saw this beauty looking at him, it'd take me a week to peel him off the ceiling. Nervavels, if you had that spider, I doubt many people would WANT to share your bathroom. Even if they had to go down the street to use another one! I think I would have to move! I would rather have a bat in my house than huge spiders. Ironically, seeing this spider is the very thing that would make you need toilet paper. I would run from the bathroom screaming. I don't care for spiders and especially don't like big ones! I will never look at a roll of toilet paper the same way again. BTW, I don't know the exact species, but from the shape of the legs I know it's a giant crab spider, the family is called Sparassidae. Well, the good news is that bites members of the Sparassidae usually aren't dangerous (read: fatal). Still, probably best to leave such a beasie be, or perhaps carefully locate it to a less critical location. That's true funkymonkey. In fact, the vast majority of spiders pose absolutely no risk at all to humans. You can get a sore red spot from a lot of them (I know from experience :p), but it's only slightly more than a handful of species that can cause actual tissue damage. YAAAAAARRRRGGGHHHH!!! 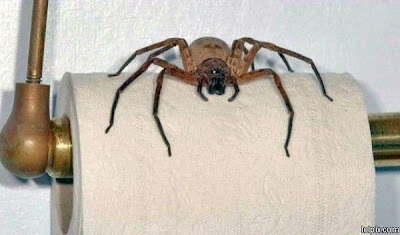 If I find one like that in my toilet I'll have a massive heart attack. It seems Clock Spider is moving into new territories. Is nowhere safe from it's insidious mind control powers? Translocate it "to a better location"??? Man, if I saw this thing, I'd sure "locate" it fast.... under my shoe! Wham! While the thing is still sitting up there looking at me.